I just made two big pots of soup for a meal exchange tomorrow, plus I have two zucchini breads baking. It’s quiet. I feel inexplicably sleepy considering that I literally went to bed at 7pm last night. But now it’s 10:45 and I’m just waiting for the bread to finish and to write a little post for you. I’ve had a lot on my mind lately. Namely, how can I achieve the ideal balance of family flexibility with fulfilling work that brings in enough money? The conundrum of all parents. This, frankly, is the main area where I currently miss having a partner–the second income. The second income is so critical in a city like San Francisco. As I pay the bills each month, I’m pretty shocked that I’m even coming close to cutting it, given the ridiculously high cost of child care. And, while I’m more or less cutting it at the moment, at times it feels unsustainable. First of all, WHY is child care so expensive? I’m not directing this question at our dear nanny V. Given the economics of child care in SF, she charges a fair rate and is very experienced, reliable, and loving, and she deserves it. But why in the world do we not have a subsidized child care options in this country? Why can’t we learn from European countries? It is a huge penalty that all families pay as soon as both parents go back to work–and it’s enough to drive many women (let’s face it) to stay home when they otherwise wouldn’t. I knew this was coming. But now that it’s here, it’s painful. My money is just flowing, flowing, flowing out of my accounts. It’s a huge adjustment. On top of that, I live in a city with outrageous rental prices. I have a good deal on my place, but it’s still a two-bedroom that I’m covering by myself. Meanwhile, one-bedrooms are going for $2600/month on average, which makes everyone freeze in their tracks, realizing they are stuck wherever they are now. And more and more people talk about leaving–going to the East Bay, Portland, or back home, because no matter where that is, it will be cheaper. (Unless it’s New York.) Everyone is one eviction away from having to leave the city. It’s nuts. But here’s the thing: I really, really love it here. Yes–the city is in one of its boom times, full of entitled, mega-rich, young people. And yes–this phenomenon ultimately drives out the very people who originally made the city interesting. But these phases come and go. And this place is so beautiful, so close to nature, so full of big-hearted people, even if they don’t say hi on the street. It’s quiet and slow-paced while simultaneously being the center of the tech universe that is radically changing the world. It is truly, almost unbelievably, diverse, in all senses of the word. And…the burritos!! Plus, I love being a mom here. My mom friends are smart, generous, thoughtful, creative–and they seriously grow on trees. They are so easy to meet. I collect them, I love them. Not all places can claim such a nonstop fabulous collection of women. And I want baby E to be a proud San Franciscan, to be surrounded by kids from all over the world and from non-nuclear family structures, where being a donor kid isn’t weird (or at least isn’t that weird). He’s already an outdoors kid. We’re going to hike many, many trails here. I’m figuring it out. I’m visualizing abundance. I know why I’m here. And life is unpredictable–we’ll see if there’s a lucrative opportunity around some corner. I’m just happy we have the basics covered–and the blessings that money can’t buy. Great news: we are communicating! Baby E started waving (sometimes it looks like more of a knee slap)–he waves at his reflection, at strangers, at loved ones. He waves when you wave to him. As we deplaned yesterday, he waved at everyone waiting behind us. It’s amazing to see such a small little brand-new person conveying his greetings. He will also dance on command. The command is, “dancey dancey.” He’ll start bouncing his knees in an irregular way, with a big open-mouthed smile. This is our first evidence that he’s understanding language. When my mom first told me about it, I actually didn’t believe her. But today I tested it out of the blue, and he started dancing. I’m seeing glimpses of an emerging personality. He’s outgoing. He might put his face in my shoulder for a second when he meets someone new, but after that he’ll slowly reach out his index finger until it’s on the person’s nose. When he is faced with something a little too scary (like someone who talks too loudly), his bottom lip will quiver and his eyes will fill with tears, but he will try to handle it rather than cry. He’s stoic. When he got a flu booster in his shoulder a few weeks ago, he gave a small protest whimper and that was that. 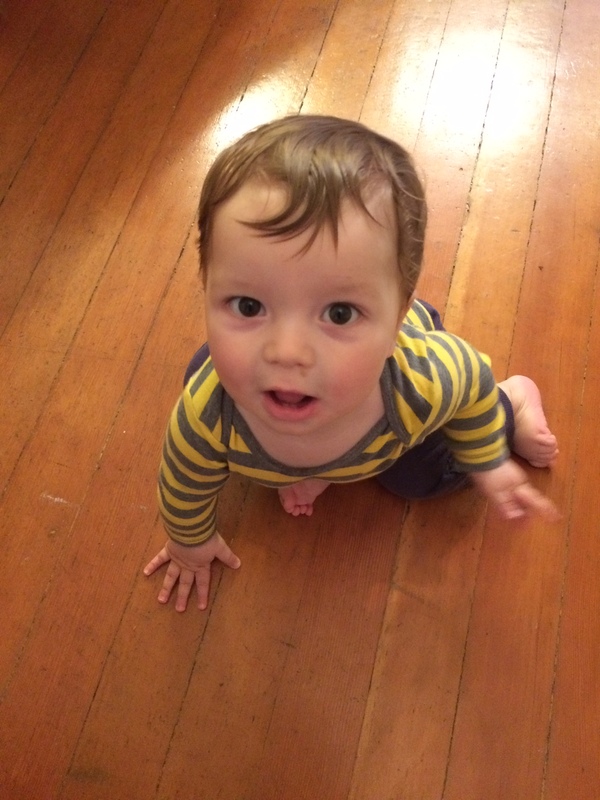 He really wants to crawl but so far is doing the ‘army’ crawl and/or scooting accidentally backward. He hasn’t figured out how to coordinate his legs to move forward and ends up in a plank or downward facing dog. Each time, I think, “Oh jeez. I can’t even do a plank right now.” This guy is strong. I took him in a pool the other day, and I let him grab the side. He basically did a pull-up a foot above the water–I could have let go (I didn’t). He loves the water–big smiles and kicks and splashes. I just got us signed up for a swimming class. He’s finally eating food! Although tonight’s sweet potato was mostly rejected, last night’s burrito offered bites of rice and beans which were met with arms-in-the-air excitement. That’s how I feel about burritos too! I’ve gotten to know the after-hours nurse line more intimately in recent weeks. First, he stuck his finger in a hot pancake and got a big burn blister between the nail and knuckle. His hand was just too quick and the pancake was too molten. I felt horrible. Other than the moment it happened, it didn’t seem to bother him too much. Now it’s all healed (thank God it wasn’t more serious). He also came down with croup right after Christmas. He got sick really fast and had this yucky-sounding cough. I took him to the pediatrician a block away and he heard the distinctive croup cough (think barking seal). He got steroids for two days and some fresh air. He recovered pretty quickly although we didn’t even realize how sick he was until he got better and returned to his squealing, jabbering, bouncing self. As this personality emerges, I feel more and more like someone is here with me–less of that pure baby energy and more of this specific little boy. A little boy who chooses to pee precisely when I take the diaper off, somewhere around 60% of the time right now! No joke!